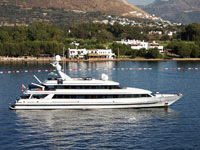 For more than two decades, Pulsor stress sensors have been installed on megayachts and historical boats around the world. The sensors are used as security devices, mounted under decking, and as automation devices, usually as triggers for cameras. Pulsors are also used for triggering lights. SURE ACTION'S PULSORS ARE invisible. Since the sensors are mounted under the decking, they are invisible to people walking around the vessel. They don't affect the decor or function of any cabin on the ship. PULSORS CAN detect motion no matter what material the vessel's hull is constructed from. Depending on the boat's construction, installers can choose from two sensors with different sensitivity levels. PULSOR STRESS SENSORS CAN be used to detect intruders as they walk around the vessel. They can also be used to trigger cameras and lighting for improved safety, security and convenience. PULSORS RARELY falsely trigger. They have a long, established reputation of being virtually false-alarm free, when installed according to manufacturer's directions. As a result, Pulsors are dependable, virtually maintenance-free, and can last for decades. While Deck Sensors are used on most boats, Sure Action's ENHP+ and HPP+ sensors are the Pulsors installed on megayachts and historical boats. Larger boats tend to be constructed from stiffer materials, such as fiberglass, aluminum, and steel. The ENHP+ and HPP+ Pulsors are sensitive enough to respond to the minute flex that occurs when a person walks on these materials. ABOUT THE SENSOR The Pulsor is environmentally-sealed The sensor is 3"L x 0.5"W x 0.5"H. Requires an HA2 Two-Zone Processor. Processor can have up to 4 Pulsors per zone. For outdoor applications (including boats), we recommend installing an even number of Pulsors. INSTALLATION: Pulsor's are epoxied to the underside of the boat's decking, then wired back to the main processor. Uses 22-gauge marine-grade wire. 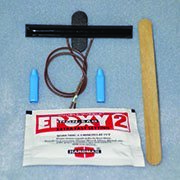 PACKAGE INCLUDES: (1) ENHP+ Pulsor, (1) Packet of Epoxy, Crimps, and Mixing Stick. 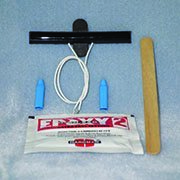 PACKAGE INCLUDES: (1) HPPP+ Pulsor, (1) Packet of Epoxy, Crimps, and Mixing Stick. Product Info | MarineGuard Home | Complete Boat Alarms | What is a Pulsor?